After pressing Left Shift to jump to quantum speed, you will be presented with a map of the galaxy. Simply click on the system that you wish to travel to and then click on the Engage button to enter the next system. Blue systems are friendly/neutral towards you whereas red systems do not like you. You can push Left Shift as a shortcut to Engage. Your current location on the map is shown by a red arrow. Your destination is shown by a target graphic. The path that your ship is going to take is shown by a series of white arrows. Your ship must travel through all the system along its path to reach its final destination. Active missions are also shown on the map. 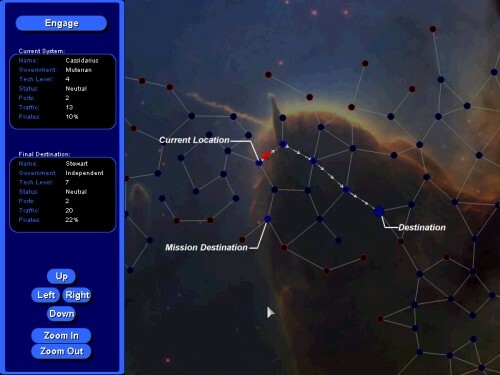 A flashing dot will appear in mission systems. These systems usually have some objective in them that you must complete like destroying a ship or landing on a planet. Panning around the map can be done either by putting the mouse to the sides of the screen or by using the Up, Down, Left, and Right buttons. Zooming can be done either with a scrolling mouse or with the Zoom In and Zoom Out buttons. Information on the current system and the destination system can be found on the left side of the screen. The name, government, tech level, status, ports, traffic, and pirates are displayed. Tech level is how technologically advanced the particular system is. Systems with high tech levels will usually sell many different ships, weapons, and upgrades. Status tells you what the local government thinks of you (i.e. will they attack you on sight?). Ports is how many planets and space stations the system has. Traffic tells you how many ships are usually in the system at the same time. This can be helpful if you are looking for a remote system to do some plundering. Pirates shows you how often pirates are in the system.